Go on the ultimate Great Barrier Reef trip on Reefworld one of the most unique and amazing trips in the Whitsundays. Cruise to the Outer Reef on board our comfortable, spacious and stable Cruise Whitsundays boat, before arriving at Hardy Reef, home to our pontoon, for a day of fun and adventure. Spend the day at sea for a once-in-a-lifetime experience, experiencing the Outer Reef and its amazing marine life, amazing activities, snorkelling, swimming and relaxing! During your cruise, you will get to the see the best of the Whitsunday Islands, taking in the spectacular scenery and then make your way to the infamous and amazing Great Barrier Reef. During your day trip, you'll have the chance to enjoy not only the amazing location, but also the best of the reef. You can snorkel and swim, as well as see the coral from the unique perspective in our underwater viewing chamber. You'll enjoy a delicious buffet lunch and also take the opportunity to try scuba diving or enjoy a scenic flight at an extra cost. The pontoon offers guests a spacious and stable way from which to enjoy the beautiful Outer Great Barrier Reef, and promises to be the trip of a lifetime! Experience Queensland's most innovative and spacious reef pontoon located at Hardy Reef. Featuring Queensland's largest and most spectacular underwater viewing chamber, this unique and amazing day trip is the perfect way to spend your time in the Whitsundays. 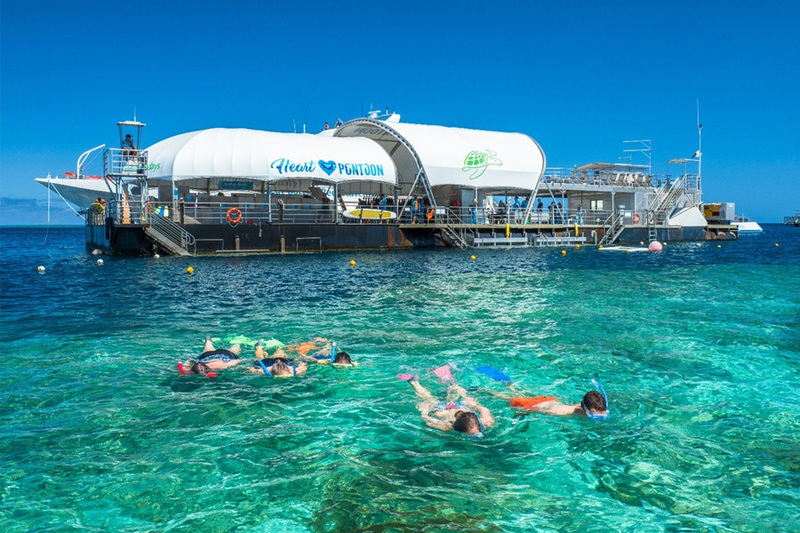 The Cruise Whitsundays Reefworld pontoon is adjacent to coral walls, the length of which you can explore by snorkelling as much as like during your day. The reef surrounding the pontoon has its own ecosystem with magnificent corals and a diversity of marine life found only in sheltered areas. It provides a unique world for you to explore and the prolific fish life will surprise and delight you - especially the giant groper! Guided snorkelling tours are also available to purchase on board with small groups the guide will take you to very special spots where giant Maori Wrasse, coral formations, tropical fish, turtles and reef sharks are there to be seen. You can also check out the view of the reef from our underwater viewing chamber, one of our favourite pontoon activities. From the pontoon you can also try your hand at scuba diving! Both introductory divers and certified divers are welcome to explore the diversity of the Great Barrier Reef from the pontoon, where its beauty will be right at your fingertips. There is no better place to experience the magic of your first scuba dive than at the outer Great Barrier Reef where you will have an unforgettable dive experience alongside other new divers and your experienced instructor! Experienced divers will also be thrilled at the abundance of marine life surrounding the pontoon, where they can enjoy spectacular dives at specially selected sites with a variety of coral formations and marine life. Scuba diving on the Great Barrier Reef is a bucket list item for any diver, and Hardy Reef will not disappoint! Please advise us at the time of booking if you would like to add any of the above optional extras. Please note: Age and medical restrictions apply to all activities at Reefworld pontoon. Please ask us if you have any questions. If you would like a deeper understanding of the sights you will see, take a guided snorkelling with Reef Safari. Your guide will point out and name all the amazing species you will encounter along the way, so you will know all the amazing things you're witnessing! The team of onboard photographers will capture those hard to get shots - perhaps of your first underwater experience, getting up close and personal with a groper or Maori Wrasse! Photos are available for purchase at the end of the day, where you can walk away with your captured memories that will last a lifetime! For the ultimate in peace and tranquility indulge in a soothing massage while overlooking the incredible Great Barrier Reef. The relaxing surroundings, combined with the lull of the ocean and softness of the ocean breeze will make for an unforgettable and serene experience. Please note the above optional activities are available for an additional cost and can be booked at the pontoon. Minimum age for Seabob is 12 years old. A sumptuous buffet lunch is included during you day trip and is supplied from the local and award winning restaurant, Fish D'vine. They take care to base the menu on seasonality and the best produce available, ensuring a lunch that is delicious, fresh and filling! Lunch is served buffet style, with something for everyone, including salads, meats, fish, fruits and more! Free tea and coffee is available and there is also a bar onboard serving a full range of alcoholic and soft drinks. You can also stay the night on the pontoon and sleep under the stars! Reefsleep 2 days/ 1 night under the stars on the Great Barrier Reef! *Kids Go Free offer valid for travel until the 30th of September 2019. One full fare paying adult must be booked per child for promotion to apply. Blackout dates apply (17-25 April 2019). Please bring only a small bag with: hat, swim-wear, beach towel, camera, sunscreen 30+, cash or credit cards for on board purchases and jumper or jacket. Drinks, alcohol, snacks, photographs, souvenirs, scenic flights, guided snorkelling tours and the Seabob sea scooters. All departures and itineraries are subject to weather. Tours may be changed or cancelled for any reason at the discretion of the tour operator. It should be noted that adventure travel involves risk. Whilst we make every effort to safeguard clients, we cannot be responsible for personal injury or loss due to actions of our clients which are beyond our control. We recommend that all clients have travel insurance covering illness, injury, loss or damage to personal belongings and not being able to travel on the confirmed date of departure. Also please note is select swag accommodation this is a camping experience so sleeping on deck open to the elements and weather. Please be aware operators pass on credit card merchant fees so there is a non-refundable 2.5% surcharge for VISA and MASTERCARD card purchases. Please advise us before booking if any passengers are under 18 years old so we can make sure appropriate trip. Please ask us for more details.